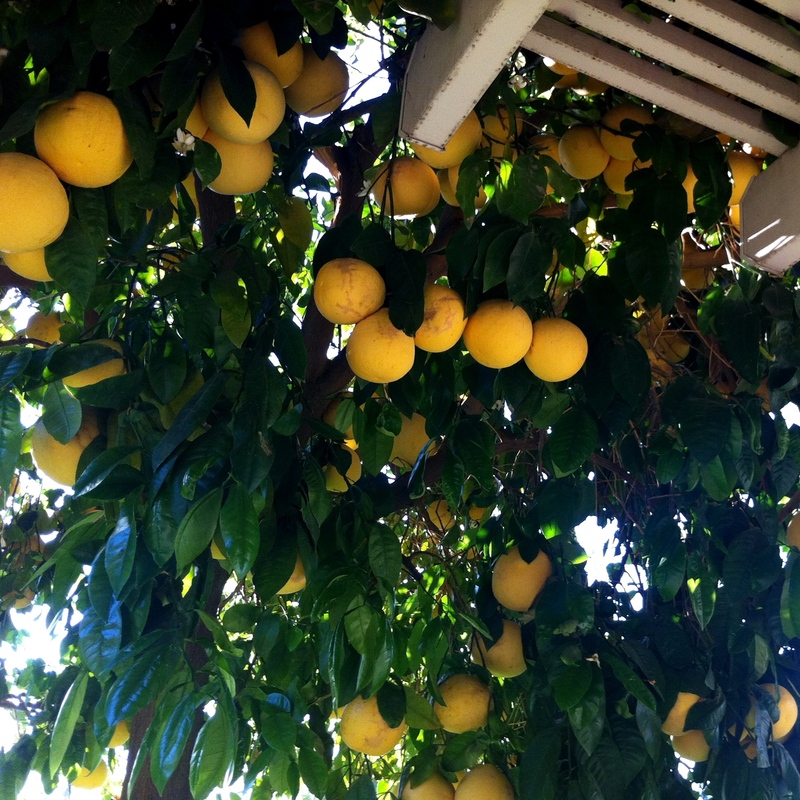 It’s not as easy to get beautiful, fresh organic citrus here in Vancouver. It is possible, but not easy. When I do find them I tend to go a little bit overboard. Eating them on their own at breakfast time, squeezing them into drinks at cocktail hour and adding them to a variety of meals. Is there anything as wonderful as freshly squeezed juice? 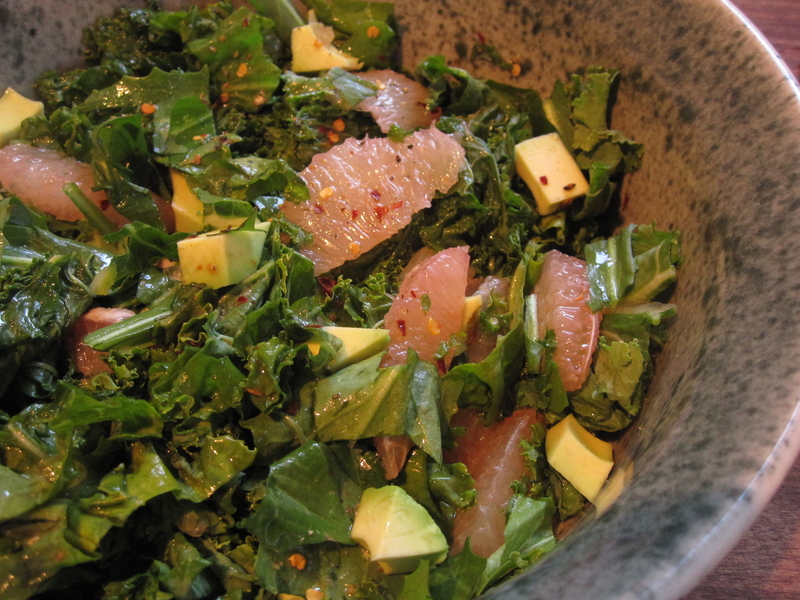 I recently picked up some gorgeous, but expensive, pink grapefruit at the market and inspired by one of my most used cookbooks, Canal House Cooks Everyday, made a grapefruit and greens winter salad. If you need a winter salad perfectly suited to both brighten up your cold winter blues and stop that winter cold in its tracks this is the one. How do you eat your grapefruit? 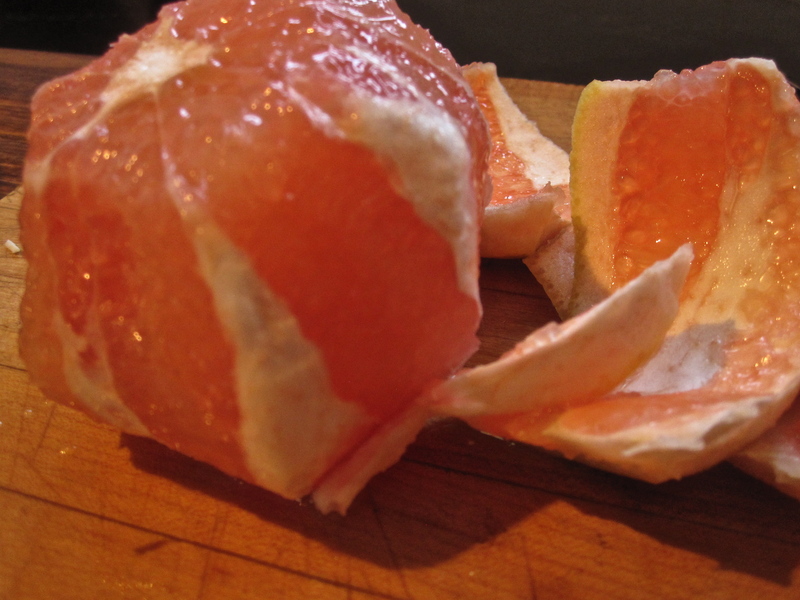 Slice both ends and the rind off of the grapefruit. Over a large bowl or deep dish cut around each segment to release it and let it drop into the bowl. When all segments are free squeeze any leftover juice from the fruit into the bowl. Add vinegar, garlic, olive oil, chili flakes and flax seeds. Gently toss. Add chopped greens and salt and pepper to taste. Let sit at least 30 minutes to allow the greens to soften. Add avocado chunks before serving. Don’t hesitate to try different variations of greens. For a change try collards, escarole, rapini or mustard greens. This entry was posted in Cooking, Food, Fruit, Lunch, Salad, Uncategorized, Vegetarian and tagged avocado, collards, dandelion, grapefruit, kale, salad by mostlynoodles. Bookmark the permalink. Thanks for follow (and liking the name!). let me know if you try and variations of the salad – and please go enjoy some citrus on behalf of all of us up here in Canada! I’m having a tangerine right now actually from a grove not too far from here! And, hey, enjoy the four seasons on behalf of us floridians!